Frederick Gerald (Gerry) Buck was born in Hanley, Stoke on Trent on the 18th August 1916. His father, Fredrick Arthur Buck ran a family Jewellery business in Lamb Street Hanley and lived at the shop premises with his wife Alice whom he had married in the summer of 1915. In 1923 Gerry’s brother Arthur Ronald (Ron) was born. After education at the junior and High School in Hanley, Gerry was apprenticed to Howell Stanway, a very large electrical engineering company in Hanley. His love of models was already well established, and so it was a short step to joining the newly established North Staffs Model Engineering Society where he was introduced to the delights and possibilities of internal combustion engines. He had previously built a whole succession of model boats so the combination of model boats and small internal combustion engines was too strong to resist and Gerry was still in his teens when he built two racing tethered hydroplanes and engines. The better known of these was ‘Icanopit’, an ‘A’ class boat with a 30cc single cylinder two stroke, while ‘Speck’ was smaller and had a 15cc two stroke motor for the ‘B’ class. He also constructed a steering or straight running boat with a 25cc four-stroke engine named ‘Cheerio’ that was reckoned to be "almost in the racing class". On June 1st 1936 Gerry Buck attended his first hydroplane regatta as a competitor, and just two months after its appearance ‘Icanopit’ recorded Gerry’s first ever win. During the course of the year, the Jewellery business moved from its original location in Lamb Street to new premises at Piccadilly in Hanley, where as F.A. Buck Jewellers it flourishes to this day. After many years of living ‘above the shop’ the family moved out to ‘Villa Marie’ at Sneyd Green. 1937 saw Gerry win his first major trophy, with Cheerio taking the Livesey Cup at Fleetwood. Although fully committed with his boats he somehow he found the time and resources to build two model steam locomotives, a 2-½ inch gauge Fayette and a 3-½ inch gauge Princess Marina. Although the North Staffs Society had a track Gerry set to and built his own 250 foot long railway in the garden of his parents house. Throughout the following season ‘Cheerio and ‘Icanopit’ kept Gerry on the results sheets and at the Grand Regatta the only two-stroke boat to complete the 1000yds Mears trophy event was ‘Icanopit’. On the outbreak of war in September 1939, Gerry moved to the Rolls Royce ‘shadow factory’ at Crewe inspecting Merlin aero engines. 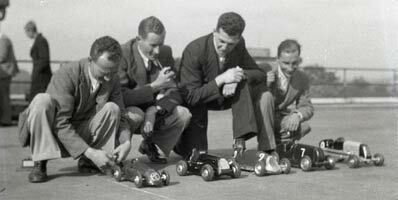 With the MPBA stopping all official regattas, and a complete ban on flying model aircraft, modellers turned to building cars powered by small IC engines. These appealed to Gerry and it was not long before the first of his own cars was under construction. ‘Old Number 1’ as it came to be called was very large car with 6" ‘ash tray’ tyres. 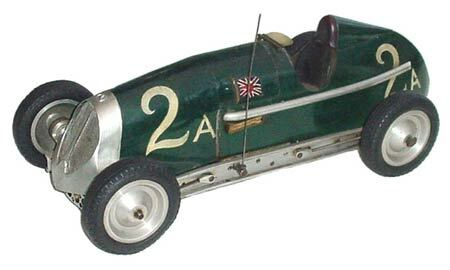 A semi scale tinplate body in the style of a racing car with a headrest, steering wheel, ‘aero screen’ and an exhaust pipe all added to the appearance. 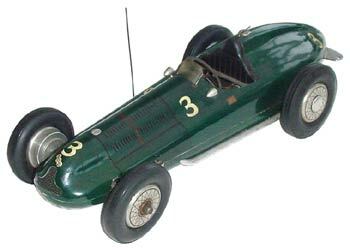 Paintwork in British racing Green (what else), a large number one and a Union Jack emblem completed the impressive model. In December 1940 life changed forever for Gerry Buck. The factory at Crewe was in full production seven days a week and Gerry was still at work in the late afternoon of Sunday 29th December when a lone Junkers 88 headed towards the factory. Flying low, the Junkers dropped two large bombs at 3.09 pm. The first went through the roof of number 2 machine shop killing 5 women and twelve men. The blast blew machinery and shrapnel in all directions and in shop number 16 nearby Gerry was hit and crushed by flying debris. The second landed in a yard doing considerable material damage, but with no further loss of life. A grim memento of the raid. A piece of the bomb casing. Having been rescued and taken to hospital it was discovered that Gerry had severe injuries to one arm and even worse injuries to one leg and foot. Once the damage was repaired he was transferred to Winnick hospital at Warrington for a very long period of convalescence. While his mobility was severely restricted, his desire to be doing things was undiminished and it was not long before he had persuaded his father to bring in hand tools from home and a vice that was bolted to his bedside cabinet, so he could continue work on his car. When he finally left the hospital Gerry had recovered the use of his limbs but the injuries to his foot were to continue to trouble him. He was unable to return to work in the industrial environment and in 1942 he went to work for the family jewellery business. The change in circumstances gave him more time to devote to the models and his first job was to repair ‘Number One’ damaged late in 1941, while he demonstrated the car to members of the North Staffs Society. In 1942, with the flying of model aeroplanes prohibited, the editor of Aeromodeller Douglas Russell was looking for other avenues to fill the editorial space and so he proposed and sponsored the Aeromodeller Trophy for tethered cars. 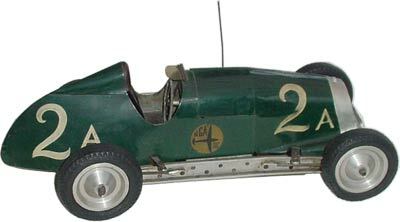 ‘Number One’ at close on 12lbs was far too heavy, ponderous and slow so a completely new car was designed. With unarguable logic this car was called ‘Number 2’ and was based on a channel section aluminium chassis and a 7.5cc Bunch Gwin Aero engine. Conscious of the need for the car to be as light as possible he set about the chassis with a vengeance and ‘drilled holes in everything’ with the result that the complete car weighed in at just 4 lbs. A distinctive and realistic tinplate body covered the works with the cockpit fully upholstered and a string bound steering wheel protruding from the dashboard. A dummy exhaust ran down the left hand side of the car to complete the look of a real car. Buck car number 2, christened ‘Dizzy Lizzie’ initially managed just over 30mph, so the first of a series of alterations were made that produced an official timed run of 40.5 mph. In April 1943 the results were announced and Gerry Buck had won class ‘A’ and the ten guinea first prize. Development on Number 2 did not stop there and soon ‘Dizzy Lizzie’ was running at 55-56 mph. Having passed the 40 and 50 mph mark in just a few months Gerry travelled down to London to compete against other pioneering racers in the first proper race meeting. The preparation, reliability and speed of his car proved beyond the reach of the others and Number 2 ran out the winner by a clear margin. The next outing was to be a salutary experience for Gerry as ‘Dizzy Lizzie No 2’ was totally destroyed when the flax tethering line broke and the car hit "A massive steel cabinet"
The car was comprehensively wrecked but Gerry set about salvaging what he could. Only the cylinder from the engine was undamaged but bit-by-bit he remachined and rebuilt each part. Gerry reasoned that there was nothing wrong with the design or performance of the car, so he would build an identical chassis and body. This decision led to the creation of the best known and most easily recognised tethered car ever, the ‘Buck 2A’. At an informal meeting that year, run on 14ft lines, 2A averaged 67mph for the ¼ mile for a new, but unofficial, British record. During the winter of 1943 he also gave considerable thought as to what a successor to 2A might look like, sketching out ideas for a new engine as a basis for ‘Dizzie Lizzie’ No 3. During 1944 Gerry came up with an ingenious timing device that would fit into his jacket pocket, yet time a car accurately to1/100th of a second over any number of laps. In the first of what were to become regular contributions to Model Engineer, and the specialist Model Car magazines, he gave a detailed description of the design and manufacture of the timing gear. Gerry’s brother Ron was de mobbed in 1945 after having served in the RAF as a flight engineer and joined Gerry in the family firm. 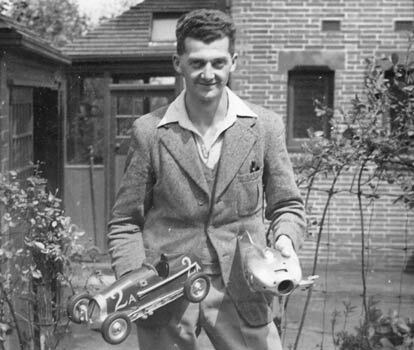 Gerry claimed that 1945 was "quiet for him on the racing front" as he had been busy with another major construction project, a 42ft dia car track in his parent’s garden. The track became a focal point for local children an adults alike and contemporary photos show the banking lined with spectators. Later it was also to serve as a control line circle when Gerry started flying model aircraft. In the spring of 1946 Gerry married Joan Kent who he had met at a local tennis club and moved in to Beacon House at Baddeley Edge, just outside Leek. An early visitor was Richard Dimbleby who conducted a long and detailed interview with Gerry for ‘Down Your Way’ on the BBC. Gerry did manage to visit Eaton Bray in August where 2A shattered the British record with a run a 66.6 mph, some 10 mph quicker than the previous best. Convinced that the car was capable of running even faster the final run of the day established a new record of 75 mph. In an article in Model cars, the engine for ‘Dizzie Lizzie’ number 3 was revealed. 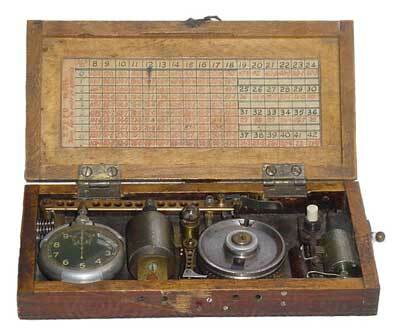 The new engine had been completed a year previously and had been consigned to a tin box without ever having been run. Several months would pass before ‘Dizzie Lizzie’ number 3 or ‘Topsy’ as it was to be named had its first run, and in the meantime 2A was kept hard at work. 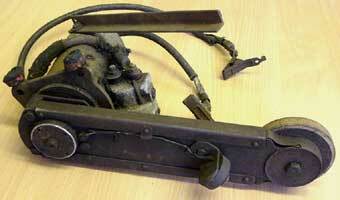 In November at Eaton Bray Gerry revealed that he had another little trick up his sleeve, "A most interesting electric starting device" that could be applied directly on to the flywheel of the engine. In a very rare insight into his travelling arrangements Gerry commented that he had built 2As carrying box strong enough to provide a seat in the corridor, which is where he invariably ended up on his long train journeys. Car travel is taken for granted now, but the effort required covering the distances that he did over the years using public transport or via lifts is yet another example of his extreme commitment. Gerry did not own a car at all until the early 50s, and even then it was shared with brother Ron. The Whit weekend of 47 involved yet another trip to Eaton Bray, this time for a two day meeting. The Sunday race was a handicap affair as mutterings were already in the air about ‘unfair competition’ and a general feeling of dissatisfaction from those who were less successful. One established competitor at the time commented (that), "When Gerry Buck turned up and went twice as fast as my car there was no point in continuing." Back there for the September meeting, 2A was really flying covering the half-mile distance at a record 75mph and continued at that speed for a new mile record at 75mph. The fastest ¼ mile worked out at 78mph for another record. This was really the swansong for 2A as a record breaker as it had far exceeded its original expectations and ‘Topsy’ was now ready to be revealed. Modelled on the ERA E type grand prix car, number 3 in the line of succession used a beaten aluminium pan with the home built engine laid horizontally on a spur mount driving the rear wheels. ZN racing wheels and pneumatic tyres ensured that the whole car was British from end to end. Painting and detail finishing would have to wait for a while, as Gerry was eager to test his new creation. The level of design and manufacturing skill he displayed can be judged by the fact that the car on its first trial run exceeded 85mph. This alone was an incredible achievement as the engine had not been run before the test, but just days later on its first ever official run, ‘Topsy’ upped the 10cc record to 87.3mph. Two weeks later the 90mph mark was broken for the first time. With 80 and then 90mph being achieved in only a matter of months, comments about the level of competition were now even more relevant. Several cars were now sporting imported Dooling and McCoy engines and as Gerry had predicted competition was becoming very close. At the Whit weekend meeting at Eaton Bray a 91mph run in the Austin trophy was only good enough for second place, but on the Monday ‘Topsy’ excelled, as it reeled of lap after lap in the 90s taking the ¼ mile at 97.55, the ½ mile at 93.26 and the mile at 90.45. In one run he had set a new fastest ever mark and taken the mile record by 4mph. Just five weeks later Gerry Buck realised what must be the most outstanding achievement in tethered car racing in Britain. At Rists on the 11th July ‘Topsy’ on a 21ft line made the first ever run at over 100mph. This was a landmark in itself, but even more amazing considering that it was with a car and engine built entirely by himself. The rest of the season brought the normal crop of trophies and victories including the Russell Trophy, where ‘Topsy’ now resplendent in BRG paintwork, fully detailed, even to simulated wire wheels, scored a full 50 points in the ‘concours’ section.